Unfortunately many churches nowadays are falling victim to vandal damage. Sometimes the damage is caused simply by a child playing ball in the churchyard and sometimes, unfortunately, by people with a lack of respect for property and church buildings. 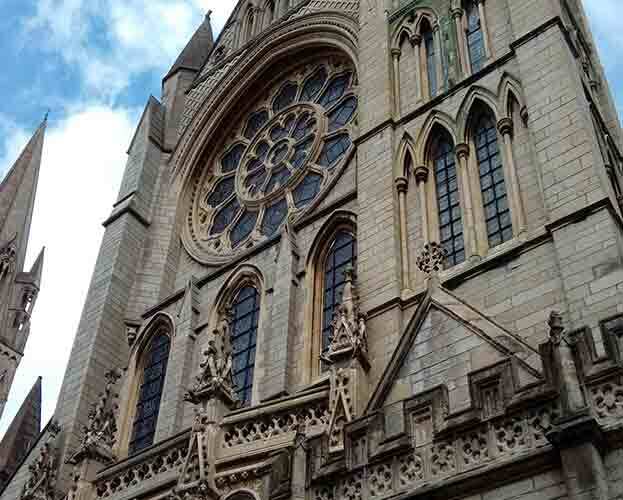 As a result, the need to protect the expensive glazing on historic buildings, churches and other property from the attention of vandals is becoming more common. At Glasswood we produce and install purpose made stainless steel mesh guards. .These are made to be as unobtrusive as possible and they sit within the stone reveals. The guards are manufactured from, typically, Grade 316, 8 gauge welded stainless steel mesh with 3 ” x 1/2″ slots. They can be polyester powder coated in black to make them as unobtrusive as possible. Polycarbonate screens – An alternative is to install purpose made polycarbonate screens. These screens are often preferred where the glazing is clear, such as fine etched glass, where the mesh option would detract from the view of the window. They are held in place by stainless steel brackets and are ultra violet protected. Glasswood will carry out the works including the surveying on site to measure and where required make templates through to installation. We will also manufacture guards and screens to measurements and templates provided on a supply-only basis.